I want to talk about “Gangs of New York,” an editorial showcasing the work of several prominent New York designers. It’s from the February issue of American Vogue, and was styled by Grace Coddington and photographed by Mario Testino. 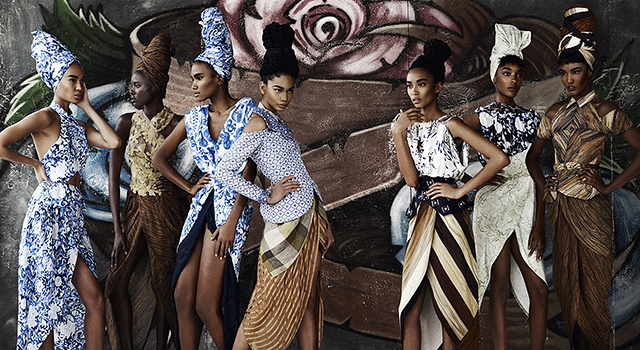 For each photo, a group of models styled to look alike wears pieces from a designer’s latest collection. There’s a blonde punky group, a brunette waspy group, a pale wispy romantic group…and an Asian “hip creative” group and a black “tribal” group (my descriptions, not the magazine’s). And while I’m glad Vogue is featuring more models of color, this creative decision is so frustrating (and not uncommon—several recent fashion shows have done the same thing). Yes, all the photos group models with similar looks. But being blonde is not the same as being Asian. When you equate the two in this way, you reduce ethnicity to an aesthetic. And when you reduce ethnicity to an aesthetic, you give ammunition to all those designers/casting agencies who claim that they only hire white models because it’s simply the right look for their brand. Just one of many reasons why this editorial is problematic. Plus, the black models are all wearing Rodarte. Putting them in turbans, in front of a wall of graffiti, with no other context, is just lazy and insulting. I want magazines and designers to hire models of color, but not if they’re always treated as token representations and novelties. That goes for plus-size models, too. When is fashion going to get it together? See the full editorial here.